Hamilton: An American Musical. Lin-Manuel Miranda. Original Broadway Cast Recording (Atlantic). It really is as brilliant as everyone has been saying for the past two years. And as everyone already knows, it is the story of the Revolutionary War hero, Federalist Papers author and founder of the Federal Reserve Alexander Hamilton told through rapid-fire rap. Miranda's tongue-twisting wordplay is performed trippingly by himself as Hamilton and a largely African-American cast portraying his revolutionary compatriots such as Aaron Burr (Leslie Odom, Jr.), George Washington (Christopher Jackson), and the Marquis de Lafayette (Daveed Diggs). Unlike my lucky partner, I still haven't seen Hamilton on stage, but the cast album stands on its own. 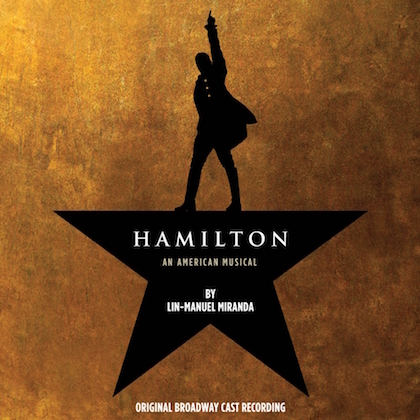 Miranda's musical references range from Gilbert and Sullivan (Pirates of Penzance) and Rodgers and Hammerstein (South Pacific) to LL Cool J Biggie Smalls ("Goin' Back to Cali") and Grandmaster Flash and the Furious Five ("The Message"), but Hamilton is also dazzlingly unprecedented. And at a time when voices have been raised in fear and anger against immigration, the musical points up the foundational role of immigrants and people of color in creating and sustaining our country and its ideals. Many thanks to the relative who gave this album to me thinking I might enjoy it; if I had to limit myself to a single favorite recording heard this year, Hamilton would be it. 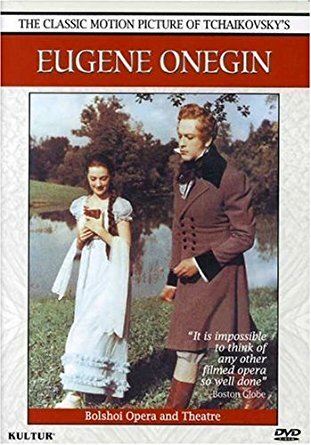 Eugene Onegin (1958). Directed by Roman Tikhomirov. With actors, singers and dancers from the Bolshoi Opera and Theatre (Kultur DVD). Speaking of biracial national heroes: Alexander Pushkin, Russia's most revered poet and the author of Eugene Onegin, was descended from an African slave. This film of Tchaikovsky's opera of Pushkin's novel-in-verse features actors lip-synching to the now-classic recording conducted by Boris Khaikin. Although the lip-synching is sometimes apparent, the arrangement also has some key advantages: Tatiana, a young woman awakening to first love, is portrayed by 21-year old Adriana Shengelaya. The soprano providing her singing voice, Galina Visnevskaya, was more than a decade older, and on film, with its unforgiving closeups, would likely have been less convincing in the role of a lovestruck teenager. With a running time of less than two hours, the film does not include all of the music of the opera—the choral sections in particular were cut. But all of the key scenes are here, many filmed on location on beautiful country estates and in the streets around the Winter Palace in St. Petersburg (then Leningrad). The sumptuous ball scenes feature dancers from the Bolshoi, and the singing is superlative. 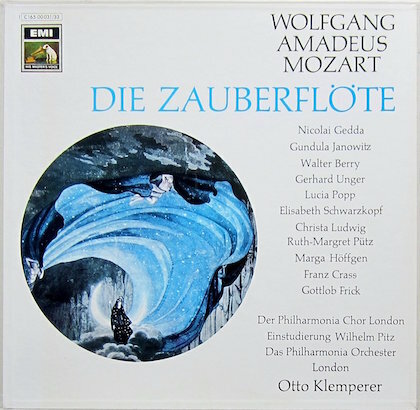 Die Zauberflöte (The Magic Flute). Music by Wolfgang Amadeus Mozart, libretto by Emanuel Schikaneder. 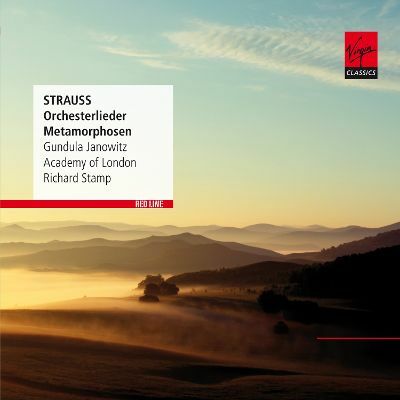 Philharmonia Orchestra and Chorus conducted by Otto Klemperer (EMI). The Magic Flute has long been my least favorite of the operas Mozart composed in the last six years of his life. It wasn't only the tenor hero and the spoken German dialogue that presented difficulties; Schikaneder's libretto also seemed like a mishmash of unsubtle symbolism, patent misogyny and blatant racism. But after discovering this recording, I can now more fully appreciate that The Magic Flute also contains sublime music. Klemperer cut all the spoken dialogue and packed the cast with great singers such as E & I favorites Gundula Janowitz and Lucia Popp. If you haven't had enough of my opinions about Mozart's most-performed (and by many, most beloved) opera, please see the full post on The Magic Flute, That post also features Janowitz singing Tamina's "Ach, ich fuhl's" and Popp singing the Queen of Night's "Der Hölle Rache." Two other recordings by the leading women of The Magic Flute were also among my favorites this year. 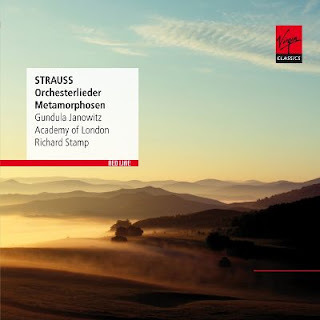 On Strauss: Orchesterlieder/Metamorphosen (Virgin Red Line) Janowitz sings a program of Richard Strauss's orchestral songs with creamy tone, accompanied by the Academy of London conducted by Richard Stamp. And The Very Best of Lucia Popp (EMI) is a two disc-set that includes many of Popp's most cherished recordings. Her versions of Strauss's Vier Letzte Lieder, with Klaus Tennstedt and the London Philharmonic, are surpassed only by those of Janowitz with Herbert von Karajan and the Berlin Philharmonic. To hear Janowitz and Popp each singing Strauss's radiant "Morgen! ", please see my post "Five songs." And to hear each of them singing one of his Vier Letzte Lieder, please see "Four last songs." Allegrezza Del Nuovo Maggio. Music by Biagio Marini. Emanuela Galli, soprano. 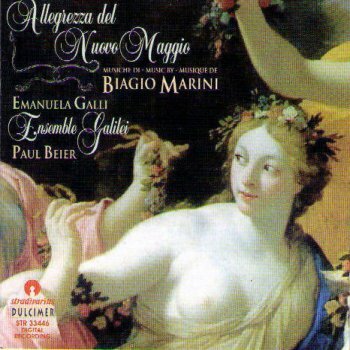 Ensemble Galilei; Paul Beier, director (Stradivarius). This was the year I discovered Emanuela Galli. She has been recording for two decades, but as usual it has taken me years to discover what many have known for quite some time. Her voice has a timbre that I can only describe as slightly dark, or shaded; it is somewhat reminiscent of, though not quite so plangent as, that of Montserrat Figueras (one of this household's favorite singers). I was having lunch in Berkeley's Musical Offering Café when her album of Barbara Strozzi songs recorded with Beier and Ensemble Galilei, Diporti di Euterpe (Stradivarius) was being played. That album, alas, seems to be out of print (though it is available for streaming), so I immediately sought out everything else I could find. In addition to her recordings of Strozzi she has recorded discs of music by far lesser-known but very worthy composers such Durante, Luzzaschi, Stradella, and many others. Her album of music by Vivaldi's contemporaries Porpora, Hasse and Galuppi for the women of the orphanages of Venice, Le Grazie Veneziane (with the Vocal and Instrument Concert Dresden, directed by Peter Kopp, Carus) is another favorite. And the Luzzaschi album featuring Roberta Mameli and Francesca Cassinari, Concerto delle Dame (La Venexiana directed by Claudio Cavina, Glossa) would also have made the list if it hadn't been recorded at annoyingly different volume levels from track to track. La Storia di Orfeo. With Emöke Baráth (soprano). I Barocchisti, Diego Fasolis, conductor (Erato). 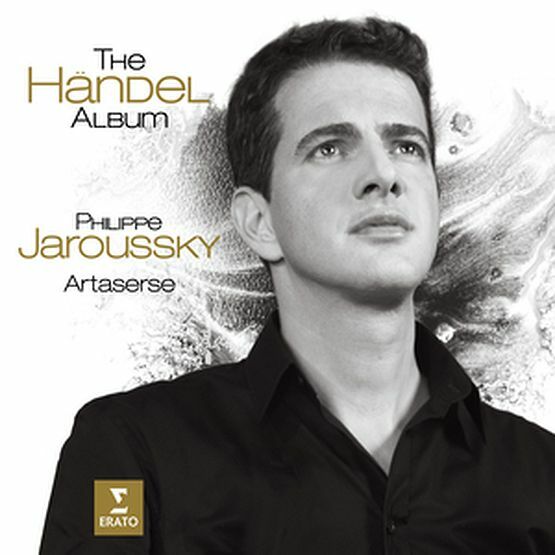 The Händel Album. Artaserse (Erato). These albums display both the virtuosic and the emotive sides of Jaroussky. 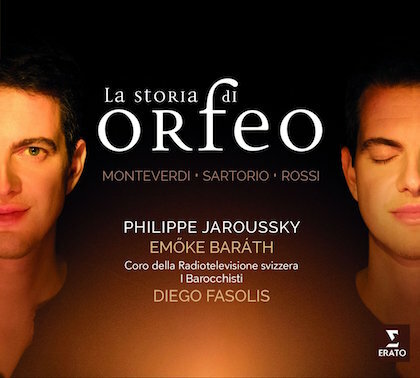 La Storia di Orfeo places compositions by Monteverdi, Sartorio and Rossi in sequence to tell the story of Orpheus and Eurydice. Jaroussky is partnered with the soprano Emöke Baráth, who sings affectingly. Has Opera News had a conversion experience regarding historically-informed performance? Of the seven concert/recital albums with orchestral accompaniment on their "Best of 2017" list, five involve period-instrument ensembles. In addition to the two mentioned above, they are Anne Hallenberg with Les Talens Lyriques (Christoph Rousset, director), Anna Prohaska with Il Giardino Armonico (Giovanni Antonini, director), and Iestyn Davies with Arcangelo (Jonathan Cohen, director).